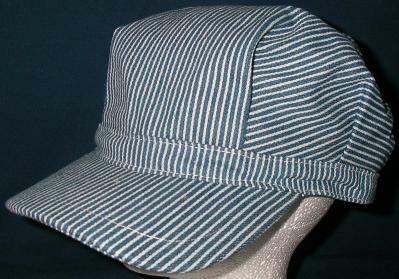 Railroad Engineer Hickory Stripe classic cap for Thomas the Tank Engine or Casey Jones. This is the original railroader style. The blue and white hickory stripes are the authentic railroad pattern. Kids and adults can adjust the tab in the back to fit. Fits ages from 6 to adult size large. All Aboard!